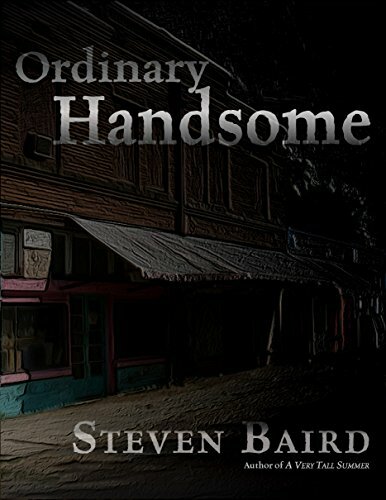 An excerpt from Ordinary Handsome. This is one of my favorite pieces from that novel. I don’t think I drew many breaths as I wrote it… I was completely inside that room. And it still affects me, every time. Arlene was sleeping when I got back home. It would be strange if she weren’t. I tiptoed into the bedroom, even though a full brass band could have preceded me. It wouldn’t have mattered. The room had a sick smell that can never be scrubbed away. It filled the house, even with the windows opened up and the wind scooting away the stale air. It was the smell of medicine and sweat and dying. Yes, dying has a smell, and I guess you can smell it on me. It fills your nostrils and falls deep into your lungs and it makes you numb. No disinfectant, no fragrant stream of flowers can remove it. Once you’ve smelled it on your hands and in your hair, it’s yours. I’ve never stopped smelling it, even before I checked myself into this place. I kissed Arlene goodnight. The room was shrouded with blankets and black curtains. A dull 40-watt light bulb constantly shone on her night table, displaying a cluster of pill bottles and cups of stale water. Her forehead was warm, and her hair dull and fine. Her breathing was steady but shallow. The skin on her face looked too tight. And her hair smelled like black tea. I don’t remember if that was its natural smell or if it’s just a never-ending memory, a smell concocted from the drugs and the sweat of dying. I think her hair always had that smell, and it was something always uniquely Arlene. I don’t remember a time when she wasn’t dying. I can’t tell you how much my heart broke with every goodnight kiss. I sat beside her for a few minutes each night and stroked her hair. I don’t know if she knew I was there, or even sensed it, but it calmed me. I would cup the side of her face and, though it was always damp and somehow greasy, I could feel the soft underneath-skin, the skin I caressed and kissed and marveled over. Minutes would turn to more minutes until I was afraid to leave her, afraid to stay. I don’t know that I had the courage to see her – feel her – die in my presence. I think that kind of courage was beyond me. But I would. I wanted her last physical perception to be my hand stroking her hair, with a kindness that let her know I was still amazed that she chose to be with me at all. It was late and I was mentally worn-out. My heart felt ready to burst from… from everything. I know I left you to die, Euart, but I couldn’t leave my wife. Her dying was more important. I would run you down a thousand times if I could have kept her. I know that won’t grant me any mercy from you, but I said I would be honest. I would kill you a thousand times if it would keep Arlene with me.